This is a very busy weekend in Austin Texas, there's a very popular music festival here that will be causing road closures and a lot of traffic congestion all over town. All that traffic got me thinking about things that need to be considered before delivering a shipping container. Do you have the room for a shipping container? Very often people will measure 40'x8' or 20'x8' and think they have plenty of room, but that's only half of it. 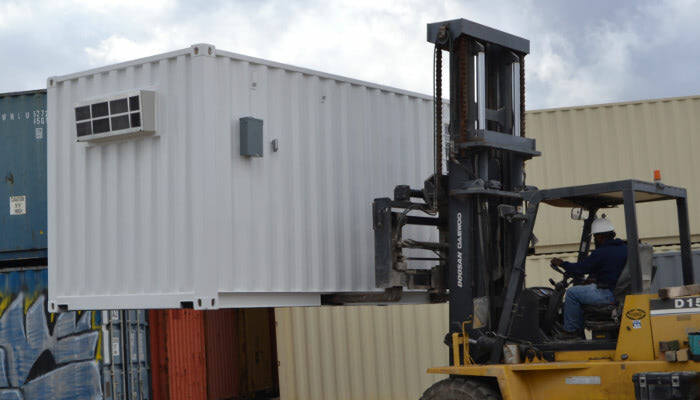 Shipping containers are traditionally delivered on tilt bed trailers which means the the only way to get the shipping container off the truck is for the driver to tilt the bed and drive out from underneath it. In tight urban settings like Austin Texas it can be challenging to find a 100' long straight line to drive, which is what is needed to deliver a 40' shipping container. Do you have clearance (i.e. overhead room) for a shipping container?. This isn't as big challenge but it can be an issue in neighborhoods with low hanging power lines or tree branches. A good rule of thumb is if you have never seen a tractor trailer go down your street you may want to investigate and find out why, more often than not it's because they can't fit. Is the site level? Try to find the most level spot you can to set down the shipping container, as part of our delivery service we'll help you level the container if you have materials to set it on. Leveling is a concern with 40' shipping containers in particular because if one corner is lower than the others it can cause a "twist" in the box and make the doors difficult to open. If you don't have 100' of run room or the spot you want to put your shipping container on isn't particularly level, don't despair you can always get two 20' shipping containers instead. If you have any questions about your particular situation feel free to call 877-704-0177.